Description: Cassie Hobbes is not like most teenagers. Most teenagers don’t lose their mother in a bloody, unsolved kidnapping. Most teenagers can’t tell who you are, where you’re from and how you’re likely to behave within moments of meeting you. And most teenagers don’t get chosen to join The Naturals. Identified by the FBI as uniquely gifted, Cassie is recruited to an elite school where a small number of teens are trained to hone their exceptional abilities. For Cassie, trying to make friends with the girls, and to figure out the two very different, very hot boys, is challenging enough. But when a serial killer begins recreating the details of her mother’s horrific crime scene, she realises just how dangerous life in The Naturals could be. The Naturals by Jennifer Lynn Barnes is a psychological crime novel. The Naturals has a bit of a slow start but once the killer comes out to play the real fun begins in this creepy story. This book surprised me in a good way. When I head that the premise of this book was teenage FBI agents I half expected teen detectives running around crime scenes and actively perusing criminals, NCIS/CSI style. While there are crime scenes, this book has more of a psychological/criminological edge. Cassie and her counterparts are all mini Sherlock Holmes who use their natural talents to get into the mindset of killers in order to solve the case. It was equally fascinating and sufficiently creepy learning about how murderers went about their crimes and what they thought about their victims. 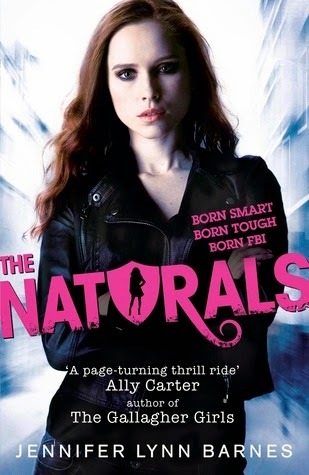 The Naturals is a great YA thriller that delves into the mindset of killers and the people who catch them. Cassie has a natural talent of looking at people and reading them. Think Sherlock Homes or Shawn Spencer. Her unique gift attracts the attention of the FBI who want her to join a classified program where teens with talent (Naturals) solve old cold cases. However there is a murderer on the lose and his sights seems to be set on Cassie. It will be up to The Naturals to solve this case. Where this book excels is in the criminal profiling and information gathering processes used to solve crime. Barnes is excellent at delving into the psychology of murderers. It’s seriously eerie guys! It was also interesting to see what clues helped Cassie to profile people and learn about them through the smallest details. It was also scary how Cassie put herself in the killer or victim’s shoes to gain insight. It wasn’t just Cassie that had a remarkable talent. The other Naturals also had interesting abilities. Michael is able to read emotions. Slone is a statistician and Lia was a specialist in deception. Dean like Cassie is also a profiler. The entire Naturals team was very unique in their own odd little ways. Each had an interesting back-story. They all stood out in their own way with all their differing quirks and relationships. As the story goes on you can see how they all form bonds with each other and learn to work in a team. There is a romantic subplot in this story but it is very minimal as most of the action is focused on catching the killer. Even though there is a slight love triangle it did not bother me, as Cassie isn’t the type to string people around. Also Michael and Dean are quite different from one another. There were chapters from the murders perspective throughout the book that were particularly disturbing. The thoughts were definitely twisted especially once the game was on. When the cat and mouse game begins you cannot help but turn the pages to find out what happens next. The killer grows more desperate and their action takes on a more sickening tone. Although the killer was easy to guess before the reveal, the motivation behind their actions was something that kept me reading the book. If you are a fan of crime thrillers than this book might be right up your alley. Good review :) Seriously! After all the talk about trying to read through TBR's and picking what I'm going to read next, I'm going to have to add another book to mine :) This sounds like a great read.